Everybody has a crust recipe and it’s one of those fussy things but with a few simple rules, it can be prize worthy both for taste and beauty. This pie is made with vodka instead of water. This evaporates and leaves a lovely flakey crust. Also the butter must be cold and blended into pea sized bits when mixed with he flour and salt. (I’ve been know to add spices into the crust like cinnamon or nutmeg, also.). 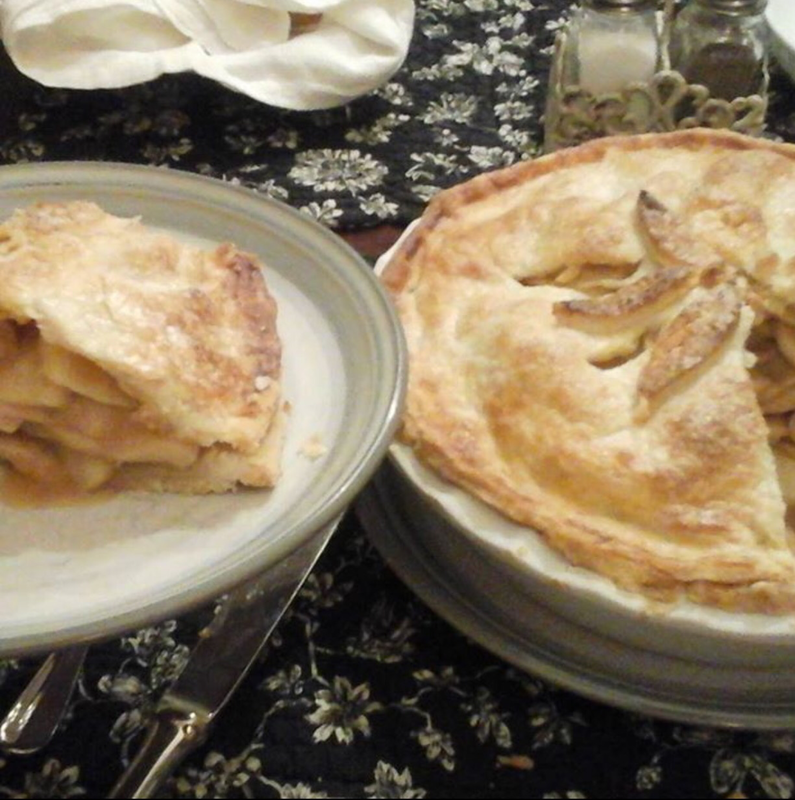 I like to overfill my apple pie but I take a few more minutes stack the thin apple pieces so there’s no air. Once the apple is peeled and cored I slice the apple pieces thinly and put them in a bowl with flour, cinnamon, brown sugar, vanilla, salt and nutmeg. Stir the apple mixture all up and layer on top of your bottom pie crust in your favorite deep pie dish. When rolling out the top crust I over size it because it’s nice when there’s extra shell to go into the valleys of apple filling. Before I lay the top crust on the pie I cut shapes out and then put them back on the pie for decoration. When the pie is assembled and the edges are crimped, I brush a wash of egg and milk on the crust and while still wet I sprinkle white sugar on top. This adds sweetness and texture.